Chelsea making effort to sign Premier League striker? 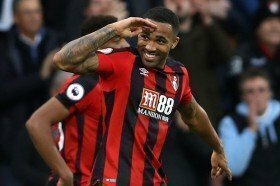 Chelsea are reportedly continuing their pursuit of Bournemouth striker Callum Wilson with manager Maurizio Sarri keen on recruiting a new marksman at the turn of the year. The Blues are currently occupying the fourth position in the standings after the opening 16 matches but there still remain concerns regarding the form of their strikers. Both Olivier Giroud and Alvaro Morata have struggled to deliver regularly in the club's frontline and a tally of just six goals in the top-flight appears to have increased the need for a new competitor. According to The Express, the Blues are still holding an interest in signing Wilson from the Cherries and they are confident that a fee of around £30m could be sufficient to push through a mid-season deal. Wilson signed a new long-term deal with the Cherries earlier in the summer and the move has since paid dividends with him contributing eight goals and five assists in the ongoing league campaign.